Sebastian Vettel has won the first race of the 2018 Formula One season after a lucky pitstop during a safety car period. The Ferrari driver had been behind both Hamilton and his own team mate until halfway a safety car period came at a very fortunate moment for the German. As the lights went out for the start of the 2018 season, Lewis Hamilton sped into the first corner, leading Raikkonen and Vettel for the first lap. Behind them, Kevin Magnussen managed to move up into 4th, thanks to being able to brake a bit later and drive round the outside of Verstappen through turn 1. Grosjean retained 6th. Further back, positions remained largely the same as well, with everybody making it safely through turn 1. Fernando Alonso was the first to really put up a passing attempt at Turn 13. The McLaren driver got ahead through the outside of the corner but later saw Sainz come back. 3 laps later, Ricciardo showed how it was done by passing Hulkenberg for 7th. Verstappen meanwhile was still stuck behind Magnussen, despite several dummy moves, but it appeared like he wasn't doing his tyres any favour by shadowing Magnussen so close. In fact, on lap 8, the Dutchman got surprised and lost rear grip in Turn 1. He spun, and was lucky to end up with the nose pointing in the right direction to continue in 8th, in between the Renaults of Hulkenberg and Sainz. Around the same time, Sergei Sirotkin parked his Williams with brake issues, followed by Ericsson who returned slowly to the Alfa Romeo Sauber pitbox. The two were joined later by Gasly, handing his Toro Rosso Honda back to his pitcrew with smoke coming out of the back of his car. On lap 19, Raikkonen was the first to pit, changing the ultra soft tyres to a new set of softs. Lewis Hamilton covered that stop the next lap while Vettel went longer on his first stint. Kevin Magnussen saw his race ruined in the pitstop. The Dane thought it was suspension failure, but replays of the pitstop, and reactions from the crew working on the left rear tyre were clear that the tyre wasn't properly fixed. One lap after his team mate, Grosjean endured the same fate, parking his car at Turn 3 after his stop. In Grosjean's case, it was even more evident there was an issue with the stop, as the car was released while one mechanic sitting on the left of the car was furiously waving his hands. 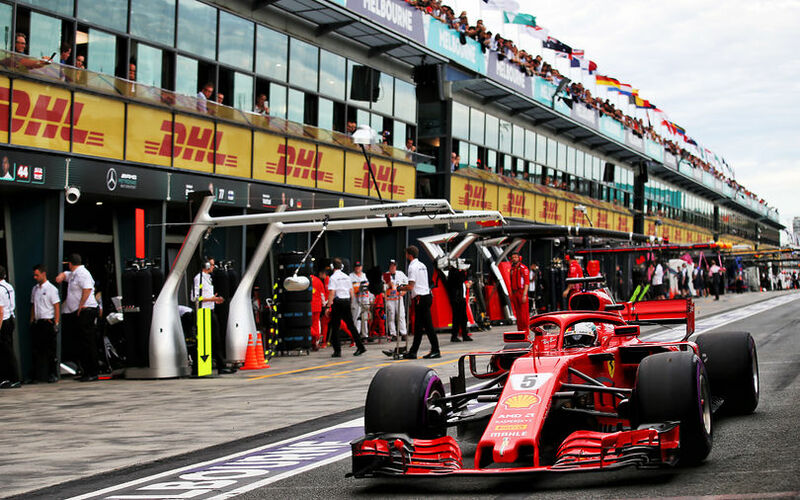 The VSC period resulted in a large number of "free" pitstops for many cars, including for Vettel, who thereby happily rejoined the track ahead of Hamilton, leaving the latter fairly unhappy with the situation. As marshalls didn't manage to get the car away from the track, the FIA brought in the actual safety car instead, neutralizing the race for a little bit longer. Meanwhile, behind the safety car, there was a bit of a fuss as Verstappen had just sneaked past Alonso as the latter came out of the pitlane during the VSC period. With overtaking disallowed, it did seem like a pass, so on lap 29, Verstappen was asked to let the McLaren driver past again., just in time for the restart on lap 31. When the race was back on, Vettel maintainedd the lead, ahead of Hamilton, Raikkonen, Ricciardo and Alonso. Verstappen immediately got under threat from Hulkenberg, but maintained the position. Behind them, Vandoorne and Bottas were interestingly using the super softs, rather than the softs that the rest of the top 12 was using. What followed was a fairly stale race, with Hamilotn keeping the pressure on Vettel, but never really able to manage a true passing attempt. After some life-and-coast, the Brit was set to try something, but immediately after setting the fastest lap, he missed Turn 8 and dropped 3s, having to redo everything again. Behind them, Raikkonen and Ricciardo were closely matched, but 6 seconds down on the leaders. Alonso in 5th had dropped already 25s, with Verstappen and Hulkenberg shadowing him. Bottas, Vandoorne and Sainz followed up next to complete the top 10. Hamilton got back to within 0.8s 5 laps from the end, before immediately dropping back again. The Brit was seen furiously pushing buttons on his steering wheel, and going two seconds a lap slower.